An Insatiable Appetite | Restaurant Reviews and Revelations - SW Fla to the Islets of Langerhans: Asiya Korepanova Plays Beethoven and Rachmaninoff in Naples, Like You've Never Heard! Asiya Korepanova Plays Beethoven and Rachmaninoff in Naples, Like You've Never Heard! A snippet of Asiya playing Beethoven's 32 Variations in C minor WoO.80. Crank up the volume on your speakers all the way, to experience 50-80 notes per second, as I did! Asiya Korepanova is not yet a household name like van Cliburn. Just you wait, as her nationwide tour unfolds, and brings her talent to many across the USA. 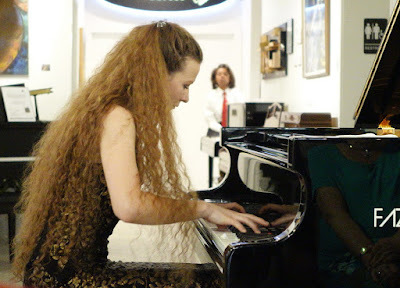 This wonderfully talented pianist practically tore the keys off the Ferrari-like Fazioli grand piano at her opening concert at Euro Pianos Naples. From the dreamily delicately soft, oh-so familiar triplet notes of Beethoven's "Moonlight Sonata's" adagio sostenuto to the Sonata's tempestuous presto agitato finale, she brought the composer's sheet music to adrenalin-pumping life. The first movement truly sounded "quasi una fantasia", an improvisational fantasy, with its idyllic calm. Music lovers soon closed their eyelids almost in unison, to better savor the cradling melody. There as many interpretations of this movement as there are pianists. Asiya's interpretation caresses your soul with its spiritual beauty. I played this movement in my piano years, long ago, and stopped after a couple hundred of times, never to play it again; I could not bring forth the beauty that I knew the sheet music possessed. Asiya played is as soulfully as I only dreamed it could be played. Thank you, Asiya. The 2nd movement's spirited sprightly melody, staccato chords and oft -repeated motif gave little hint of the raw vigor of the 3rd movement. THEN...The thunderous presto agitato movement shook the walls and ceiling of the intimate concert hall with a jackhammer's aural assault and frenzied tempo. Which would break first, the piano's felt hammers, or taut steel strings, as Asiya's fingers precision bombed and strafed 88 keys? Well over 50 notes per second were flung from her fingers at the Fazioli's responsive keys in a Faustian explosion of hot passion and icy precision. Metronome and ivories be dashed and damned! Pianist united with piano, like a jockey bound to a frantic thoroughbred. The piano's bolts of fire and rolling thunderous bass had the now incredulous audience on edge. Two tormented pianists must have been battling in the room, as waves of sound pelted and dashed the windows, walls and wide-eyed attendees' eardrums. Asiya then dazzled the audience with her intricate transcription for solo piano, of both the piano and cello parts from Sergei Rachmaninoff's Sonata for Cello and Piano, G Minor, Op. 19. The audience gave three resounding standing ovations. Asiya responded with three generous encores, then pianist and audience mixed over Prosecco and pastries. Asiya Korepanova is outgoing and bright, and just conceals steel sinews witihn her warmly welcoming handshake! She is finishing her Doctorate at the University of Miami. That's a close enough drive for a music lover to sponsor another concert in Naples, be it at a private home or at a larger venue. Don't miss it!